Villa Sip Et A is a vacation residence that exemplifies contemporary, boxy architecture and tropical chic. Minimalist interiors are appointed with predominantly complementary, in-vogue, lavish furnishings and fixtures accompanied by beautifully crafted woven wood pieces. Amenities are distinctively of hotel and resort grade – to enhance ease and fun for each and every guest. Truly, Villa Sip Et A creates for you a well-deserved break with an appeal that’s definitely swanky. The villa has three air-conditioned bedrooms – all with king-sized beds, as well as dedicated bathrooms. Only one of these has a fitted bathtub. The two other bathrooms have rain showers. The property’s idyllic exterior is almost entirely devoted to the 14-meter infinity pool. Immerse yourself in its inviting, crystal clear waters which creates the illusion of flowing in and ebbing back to the sea. For a tan, you can lounge on woven wood pool beds on the poolside wooden deck. At the villa’s semi-open, breezy and spacious central pavilion is the living area. Around its hefty, angled sofas you can gather to enjoy one another’s company. Behind one of the sofas is the dining area with its dinner table good for 10. Here, you can all get a taste of authentic local cuisine – as well international favorites – dished out by the resident chef from the well-equipped, modern kitchen across the living area. The kitchen also has a counter which, provided with stools, doubles as a bar for breakfast, snacks, beverages and all kinds of drinks. Across the dining area is a media room where you can await the next episode of the newest hit series. Or, replay your best-loved classic film. On duty to deliver the villa’s everyday services is a helpful, well-trained staff that’s comprised of a personal guest assistant, a pool attendant, a gardener, as well as housekeepers and security personnel. Aside from the chef, a babysitter, a driver, a laundry helper and a spa therapist may be called in upon your request. Their services, however, come with a separate charge. Bike, scooter, car and boat rentals are also available. 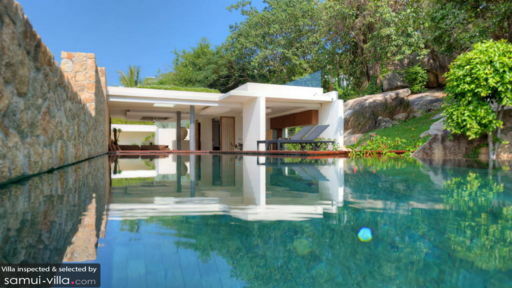 Villa Sip Et A is situated within Choeng Mon Beach. From the villa, go swimming in the bay, get active with the many water sports facilities available, or just comb the fine, white, sandy shore. At low tide, you can even cross over to the small, nearby island of Koh Fan Noi. On a Wednesday, hunt for local finds at the Walking Street’s Night Market.